Silver bracelet - a gift. But I do know that I look like I belong at the copa copacabana in this outfit. Especially with the hat. But I love the hat. 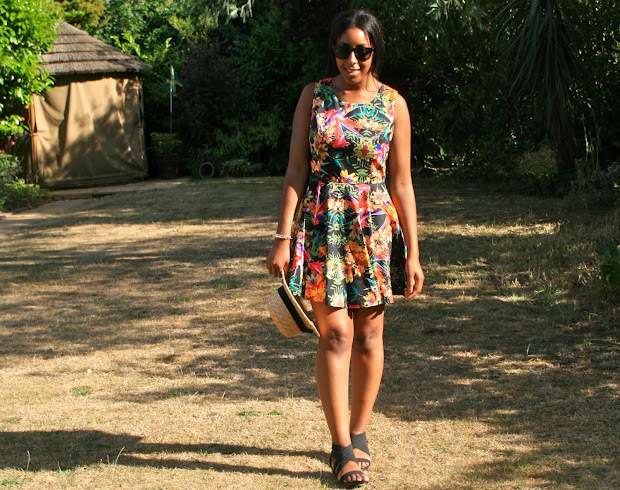 With this glorious (if not slightly stifling) weather I thought it was only right to bring out the tropics in the form of this dress from Tk Maxx, I love the floral on black look and the material is so lightweight and breezy! I forgot to capture my outfit for Wireless festival which I went to on Saturday! It was amazing but so so hot so I ended up wearing my dungaree dress, a white tee underneath with my yellow converse. I definitely looked like an overgrown schoolchild, but I'm ok with that.